Dr. Avitzur, a neurologist in private practice in Tarrytown, NY, holds academic appointments at Yale University School of Medicine. She is also the editor of AAN.com, and chair of the AAN Practice Management and Technology Subcommittee. Practicing neurologists regularly treat patients with ethnic, cultural, and language backgrounds that differ from their own. Variations in cultural attitudes are often more difficult to detect than the language barriers themselves, but good patient care depends upon our awareness of, and sensitivity to, these differences. Patients whose primary language is not English make up growing percentage of the population in the US. A US Census Bureau analysis released earlier this year revealed that among the total of 301.6 million people living here in 2007, 38.1 million were foreign-born. Mexico topped the country of birth list with more than 11.7 million. The next highest were China (1.9 million), the Philippines (1.7 million), India (1.5 million), El Salvador and Vietnam (both at 1.1 million), and Korea (1 million). And because undocumented immigrants are often reluctant to participate in census surveys, these numbers are likely to be underestimates. “Physicians need to be culturally competent because if we're not, then our patients won't get the care they deserve,” said Joseph I. Sirven, MD, director of the Epilepsy Mayo Clinic in Phoenix, AZ. Dr. Sirven believes that cross-cultural issues that can affect patient care were not given adequate attention until 2002 when the Institute of Medicine (IOM) published the report, Unequal Treatment: Confronting Racial and Ethnic Disparities in Health Care. It documented that racial and ethnic minorities receive lower quality health care than whites, even when they are insured to the same degree and when other health care access-related factors, such as the ability to pay for care, are equivalent. Among numerous suggestions, the IOM recommended that health care providers should be made aware of racial and ethnic disparities in health care, and of the fact that these disparities exist, often despite providers' best intentions. Published studies, Dr. Sirven pointed out, have shown that certain ethnic groups are less likely to undergo curative epilepsy surgery than other patient groups, even with adequate insurance coverage. “In the field of neurology, particularly in epilepsy, which is so dependent on clinical history, it's important to be able to communicate appropriately with your patient as well as understand a patient's culture in order to best help that individual,” he explained. In fact, in many countries, such as Cameroon, epilepsy is confused with insanity and believed to be brought on by ill will; in India, for example, these patients are still thought by some to get seizures as punishment for sins committed in past lives. In other places, such as in Nigeria and Uganda, epilepsy is thought to be an illness caused by witchcraft, and contagious. Dr. Sirven, who lives in Arizona, a border state, sees many Hispanic patients with mistaken beliefs and stigmas about epilepsy. “I've had patients with refractory epilepsy who have waited for years to receive care, as the cultural tendency is to hide these individuals and families, then shield the patient from the public, and that often means from the medical community as well,” he said. She has had direct experience with this challenge with her elderly family members born and reared in India. Like many of their generation, they follow a deeply rooted, karma-based belief system. “In Indian culture, especially with our elders, disease is not freely discussed. Rather, disease is frequently accepted as karma and elders will not visit the doctor as often as Westerners will,” she explained. Moreover, she said, Indian culture is still primarily male-dominated, with well-defined gender roles and a hierarchical family structure. Dr. Aggarwal described the case of an Indian couple whose elderly mother had ‘forgotten how to cook and take care of the grandchildren.’ Initially, the husband emphatically dismissed his wife's concerns regarding her mother's memory and ability to care for herself while his wife kept silent and avoided eye contact. Only after Dr. Aggarwal acknowledged the son-in-law for taking care of his elderly mother-in-law in his home, did the wife — with her husband present — feel free to describe how her mother had begun losing her ability to speak in complete sentences, and was no longer able to dress or bathe herself. Linda M. Selwa, MD, professor and associate chair of clinical activities in the department of neurology at the University of Michigan, said the role of the patient and their caregivers is often culturally-dependent. She has seen a Mexican patient with nocturnal seizures whose family decided not to give antiepileptic drugs because they felt his seizures were a punishment from the spirit world, but had never confided this to their practitioner. “One of them sat up with the patient every night to apply home remedies to keep the spirits away, until we helped them to find a traditional healer and talked about the lack of interference of medications with that process,” she said. Anne Fadiman, author of The Spirit Catches You and You Fall Down (Farrar, Straus and Giroux 1998), points that the Hmong believe that when people are unconscious, their souls are at large, so anesthesia may lead to illness or death. Fadiman also explained that for the Hmong, surgery is taboo, because if the body is cut or if it loses any of its parts, it is believed to remain in a condition of perpetual imbalance, with the damaged person not only sure to become frequently ill but also at risk of being physically incomplete during the next incarnation. Language barriers can be an added challenge to medical care. The US Census Bureau analysis revealed that, on average, 52 percent of the foreign-born population — 2 percent of the native population, and 9 percent of the total US population — speak English less than “very well.” The use of slang and colloquialisms can dramatically alter the diagnostic work-up, as Roy C. Katzin, MD, discovered in 1982 when he did his medicine internship in Charleston, SC, where there was — and still is — a population steeped in the 19th century “Gullah” culture. Now stroke director and sleep disorders co-director at Delray Medical Center in Florida, he recalls a patient who first told him her “rib” was killing her. He later reviewed the Gullah dictionary after the examination, X-rays, and a CT were all normal, and discovered that “rib” referred to her spouse (Adam's rib). In that region of the country, medicine is still performed by “root doctors” who protect their patients against harmful spiritual forces using ritual objects similar to those used by African medicine men, and Gullah herbal medicines, which resemble traditional African remedies. Although there is little formal training for neurologists in the subject of cross-cultural communication, Dr. Selwa contends that neurologists need to explore value systems about illness, disability, and selfimage in order to help patients make the best adjustments to their circumstances. “Patients come to physicians with their own needs and agendas for service. If we listen carefully to what they are asking for and how their illness is viewed in their lives, we have the opportunity to have maximal effects with our treatment,” Dr. Selwa said. • Sirven JI, Lopez RA, Vazquez B, Van Haverbeke P. Qué es la epilepsia? Attitudes and knowledge of epilepsy by Spanish-speaking adults in the United States. Epilepsy Behav 2005;7(2):259–265. • Selwa LM. Language and cultural sensitivity issues in neurologic practice. Medlink Neurology.www.medlink.com. 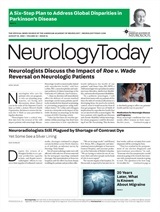 Neurology Today9(16):24-25,27, August 20, 2009.